Everyone is talking about the new Raptor, but here at Rogue Racing, everyone is talking about the new 'Enforcer' bumper. Each bumper is hand-built right here in the USA, to ensure a precision fit and excellent quality. We use high-strength steel, 112 pounds of it to be exact, making your Raptor ready to take on any type of terrain or up for whatever challenge you have in mind. Integrating with the existing factory frame horns, our 'Enforcer' bumper is designed to strengthen your Raptor by adding 5.65" of solid steel over the factory bumper. The front skid plate is 1/8" thick solid steel and coated with Line-x, the most premium industrial automotive coating on the market (we sell replacement skid plates, because we know you are headed where the pavement ends). Our production process is intended to deliver you the bumper your new Raptor deserves, and one that will impress from every angle. Need a winch? The 'Enforcer' is designed to integrate with the Warn Zeon Platinum 12-S winch (www.warn.com). Need a light? 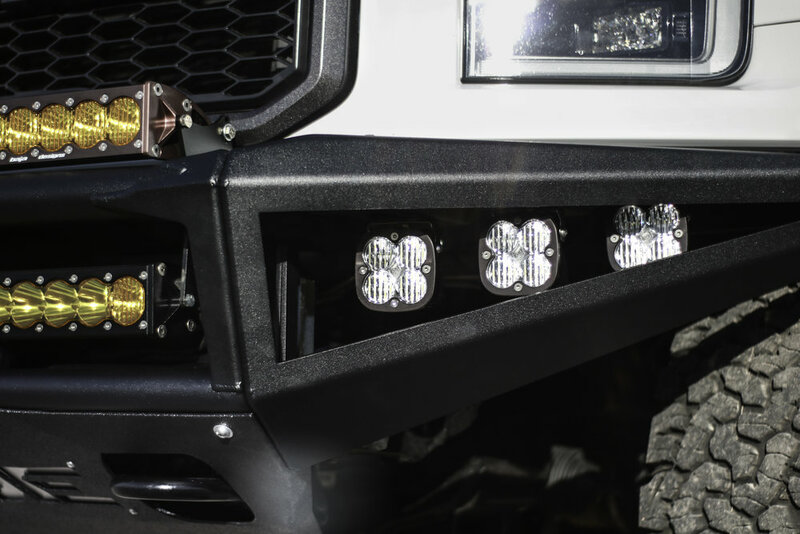 Bolt a Baja Designs 40" light bar, which we keep in stock and ready to ship with your new 'Enforcer' bumper. Call now to reserve your new bumper, and make your Raptor ready for anywhere. (702) 586-8050. Rogue Racing Stage 4 Ford Raptor suspension promotional video. Innovative Off-Road Products and Designs. Our bumpers are of the highest quality and the most precision fitting bumpers available on the market. Rogue bumpers are designed to be tough enough to handle any off-road condition, yet stylish enough for the street. Each kit is manufactured 100% in America, ensuring quality is never compromised. We meticulously design the components of each stage to compliment the next so upgrades are easy & affordable. Lighting is the perfect accessory for all bumpers and we have several solutions to fit your needs. All products are shown in an easy to view format to help make choices as easy as possible. Rogue Racing manufacturers world class suspension systems, off-road bumpers, & accessories for serious off-road enthusiasts. Our mission is to bring a higher standard of quality to the off-road industry, with innovative, 100% American made products. handmade off-road design & the latest technology. We have taken the heart & passion of "one off" handmade products & combined them with the latest CAD & computer software engineering to make them consistent, reliable, & affordable enough to re-produce for the off-road consumer. We strive to bring the same standard of quality & performance the professionals demand to you, the off-road enthusiast. Keep up to date with happenings at Rogue. FOR SALE: 2015 CHEVY SILVERADO 1500 "DOMINATOR"